We’re in the final 6 weeks of our scheduled spring legislative session with a lot of work yet to be accomplished. In the coming weeks important decisions will be made that will impact our families and communities. I will be keeping you updated each week, and as always, please don’t hesitate to contact my office with any questions, concerns or ideas you have. Your input is important to helping me best represent you in Springfield. You can call my office at 309.662.1100 or contact me via webform on my website. The two weeks in mid to late April are the weeks set aside for floor action and final passage of House bills out of the House of Representatives. That means for the next few weeks we’re spending less time in committees and more time working on the House floor. Last week I advanced two bills to the Senate. House Bill 233 outlines new DNA evidence handling guidelines for coroners in homicide investigations. It’s vital in death investigations that specimens collected for evidence are well preserved and uncontaminated, and that the police agencies involved get custody of the evidence in a timely manner. The new guidelines we advanced last week will help ensure we meet all of those requirements. House Bill 3137 also passed the House on unanimous vote. It ensures Illinois seniors and others living with chronic eye conditions will be able to obtain more timely refills of their eye drop medications by requiring insurance companies to refill eye-drop medications before the anticipated refill date for those with a chronic need. Eye drop medications are unique in that precise dosing is nearly impossible. Sometimes it takes several tries to actually get the drops in the eyes, so medication is wasted and the bottle is empty before the refill date. This early refill legislation was initiated by local ophthalmologist Dr. Catharine Crockett. In all, 444 bills had been advanced from House committees and placed on the chamber’s calendar for possible final action. You can watch the action live without having to travel to Springfield! The Illinois House streams live audio and video feeds of floor action to the general public at http://ilga.gov/house/audvidInternal.asp . Illinois has a new State Superintendent of Education. The State Board of Education this past week appointed Dr. Tony Smith to the position that supervises public schools and publicly-supported charter schools throughout Illinois. Dr. Tony Smith has experience in educational management in both the public and the private sector. He is a past superintendent of the Oakland Unified School District, operating public schools in one of the largest cities in California. In his career as an executive educator, has often specialized in issues of math and science achievement. Departing State Superintendent Dr. Christopher Koch last week was thanked for his 21 years of educational leadership in Illinois, particularly his advocacy for students affected by the Americans with Disabilities Act (ADA). President Abraham Lincoln’s death at the hands of assassin John Wilkes Booth on April 15, 1865 took place less than one week after the surrender of Gen. Robert E. Lee’s Confederate army. The assassination marked the end of the Civil War and the start of a period of national mourning and reconciliation. The Illinois House has a unique perspective on Abraham Lincoln, and he has a special place in the hearts of all who serve there. The Illinois House was Lincoln’s first political home and elected position. The future President served central Illinois in the 9th, 10th, 11th, and 12th General Assemblies, starting in 1835 and ending in 1842. These were key years in the history of Lincoln’s home town of Springfield, as the aggressive advocacy of Lincoln and his colleagues was decisive in the selection of the Sangamon River community to be Illinois’ permanent state capital. The “Old State Capital,” which still stands in Springfield’s central city, was built in response to Lincoln’s urgings. 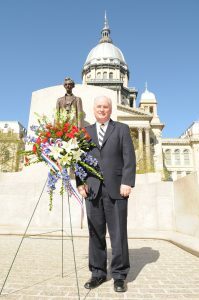 Last week I along with my fellow House Republicans paid tribute to Abraham Lincoln’s memory and legacy with a memorial ceremony at his statue on the steps of the Capitol. This was part of overall preparations for the 150th anniversary of the return of Lincoln’s body to Springfield and reenactment of his funeral which will take place on May 2 and 3, 2015. 1,100 reenactors, and thousands of visitors from all over the United States, are expected to join in the observance.